stomach for it, a Cardboard Animal Head could be the answer. Choose from Bucky the Deer, Fred the Moose, or Eyan the Elephant to dress up your man cave humanely. 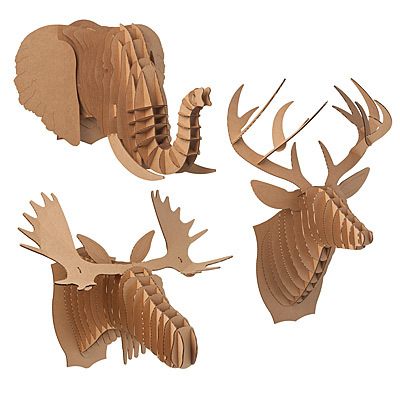 Choose from a buck, elephant or moose to decorate your digs. Mount one over the fireplace, in the den, or your cabin in the woods. Brag about your ability to bring down cardboard beasts. Easy to assemble with detailed instructions. Hangs with standard picture hooks (not included). Made in the USA of 100% recycled cardboard.